Fiat expects China sales of the Viaggio to reach 100,000 in 2013. BEIJING – Fiat expects the new China-built Viaggio to be a strong competitor in the world's largest market, where the Italian automaker has failed twice to gain a foothold. Fiat brand CEO Olivier Francois told Automotive News Europe he is confident that the Viaggio can help end Fiat's struggle to gain a foothold in China because the compact car will enter "the largest segment in the world's largest market, which equals to 6 million annual sales." Fiat plans to sell 20,000 Viaggio units before the end of 2012 and boost annual sales to 100,000 in 2013, said Jack Cheng, general manager of Fiat's joint venture with China's Guangzhou Automobile Group . If the car is not a success, it will be nearly impossible for Fiat to achieve its goal of raising China sales to 300,000 by 2014 from fewer than 1,500 last year. Fiat will start producing the Viaggio in China on June 28, ahead of a market launch in September. It will be the first model from Fiat and Guangzhou Auto's joint venture and is also an important part of the Italian automaker's plan to grow beyond Europe, where car sales are expected to decline for the fifth consecutive year. Fiat has not revealed the Viaggio's starting price. The Viaggio (Italian word journey) is a reworked version of the Dodge Dart, which is based on the Alfa Romeo Giulietta. Fiat S.p.A. owns the Fiat and Alfa brands and has a 58.5 percent stake in Dodge parent Chrysler Group. The Viaggio is slightly longer than the 4670mm Dart and fits in between the Ford Focus sedan sold in central and eastern Europe, Russia and China and the Mondeo mid-sized sedan. The Viaggio and Dart share doors and most of their interior. 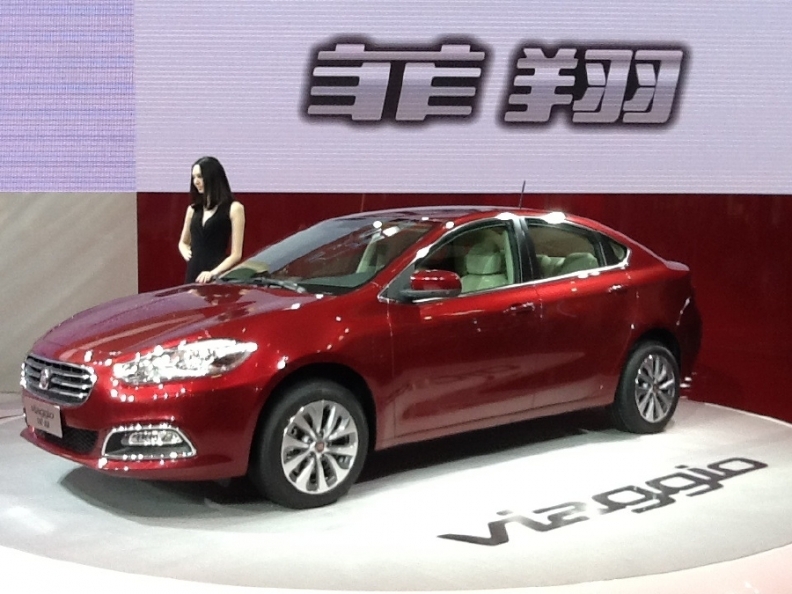 The Viaggio will be built in Fiat and Guangzhou Auto's new factory in the Changsha Economic Zone in Hunan province. Fiat and Guangzhou Auto plan to invest 5 billion yuan (about 594 million euros) in their 50-50 JV. In China, the Viaggio will be powered by locally built normally aspirated and turbocharged versions of Fiat's 1.4-liter gasoline engine. Fiat and Guangzhou's joint venture powertrain plant, which is also in the Changsha Economic Zone, is forecast to have an initial volume of 220,000 engines a year. Fiat also plans to launch a hatchback version of the Viaggio in China in 2013. That car could be exported to Europe to replace the slow-selling Bravo compact hatchback, company sources told Automotive News Europe. The automaker has been unsuccessful at gaining traction in China, whose market is expected to grow another 8 percent in 2012 after exceeding 13 million passenger-car sales last year. No Fiat models have been produced in China since the automaker's joint venture with Nanjing Automotive failed. In December 2007, Fiat sold its share in its money-losing JV with Nanjing to China's Shanghai Automotive. Fiat tried to form a partnership with China's Chery Automotive in 2007, but that deal also collapsed. Currently, Fiat's few China sales come from models imported from Italy, such as the Bravo, Linea and Punto, and Mexico, such as the 500 and Freemont, which are built by Chrysler.